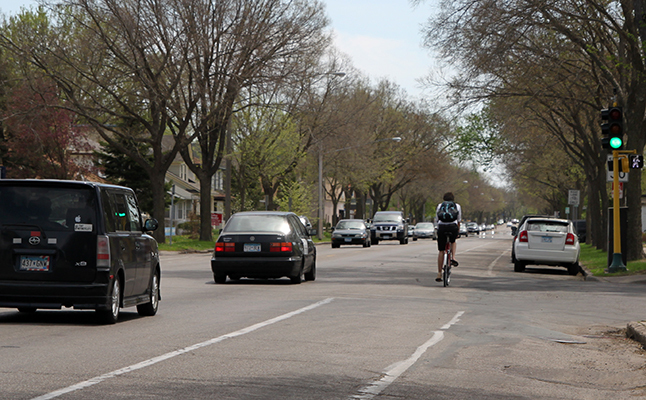 A cyclist uses the bike lane on Minnehaha Avenue. The bike lane runs between moving vehicle traffic and parked cars. Next year, Hennepin County will begin a two-year long reconstruction project on Minnehaha Avenue for the approximately 2.2 mile stretch from 46th Street South to Lake Street. Many members of the community have strong opinions about what Minnehaha should look like moving into the future, but uncertainty about details and about when and how to provide feedback are leaving some not sure that they can make their voices heard. Key decisions that will shape Minnehaha Avenue for years to come have already been made, though a larger community-wide meeting has not yet been scheduled. Members of the community are worried that the lack of significant resident engagement at critical points in the project’s development will leave many out of the conversation. If you have input on the project, you may call or email Hennepin County Project Manager Kristy Morter at 612-596-0384. or kristy.morter@co.hennepin.mn.us. Council Member Cam Gordon recommends contacting county and city elected officials, including County Commissioner Peter McLaughlin, City Council Members, and Mayor R.T. Rybak. Hennepin County has considered two options for the reconstructed Minnehaha bikeway — cycle tracks or bike lanes — and Hennepin County staff have already decided that they will recommend to the City Council that bike lanes be installed. This recommendation comes in spite of multiple community groups and residents who would like to see a cycle track installed. Bike lanes are bikeways that run next to vehicular traffic, the current configuration on Minnehaha Avenue. A cycle track is a protected bikeway separated from vehicle traffic by a line of parked cars or a physical change in the roadway. The debate over these two options is bigger than the Minnehaha reconstruction. It’s part of a larger, city-wide conversation about Minneapolis’ goals for increasing bicyclists and bikeways in the city. Additionally, the Climate Action Plan will call for a 15 percent increase in cyclists by 2025, with a 7 percent increase by next year. Proponents of cycle tracks point to several recent studies showing that cycle tracks are safer for cyclists. A recent University of British Columbia study found that cycling in a protected bikeway is five times safer than cycling in a bike lane. Fawley also commented, “A majority of the community wants a cycle track.” Additional support for cycle tracks can be found in the reader comments section of an article on My Broadsheet detailing the differences between a cycle track or bike lane. All commenters were in favor of the cycle track because of its increased safety. Actual and perceived safety are not the only benefit of cycle tracks, according to supporters. They point to evidence that shows that bicycle-friendly routes bring with them increased economic development. The New York Department of Transportation reported that when they provided a protected bike lane for cyclists, retail businesses along the route saw an increase of up to 49% in sales. Cycle tracks do have shortcomings, the primary issue being intersections. If cyclists are off-set from vehicular traffic, cars may be less likely to see them as they turn at an intersection. The orientation of intersections at Minnehaha Avenue — not directly perpendicular, but slightly skewed —raises concern that the intersections will be more dangerous for cyclists. The Minneapolis Bicycle Coalition, the Minneapolis Bicycle Advisory Committee, the Pedestrian Advisory Committee, and the Longfellow Community Council’s Environment and Transportation Committee have all taken a formal position in favor of cycle tracks. In addition, Council Member Gordon and most residents contacted for this article are in favor of the off-set bikeways. Despite the number of supporters, Hennepin County Project Manager Kristy Morter said in an email that staff have decided that they will recommend to the city that bike lanes be installed due to concerns about intersection safety, multi-modal safety, parking impacts, tree impacts, and maintenance responsibilities. These recommendations will go to the city, and the City Council will vote to approve the plan, using the recommendation of the County and community input to make their final decision. UPDATE 5/27/2013: The phone number for Kristy Morter at Hennepin County that her phone number has changed to 612-596-0384.